Legend tells of a mystical orb, later come to be known as the Orb of Sunshine, that came down from the heavens. The sun’s rays penetrated the orb, sending shards of light spreading out over the sea. Where each shard of light hit the water, an island erupted into being, thus creating Archipelago. From the initial creation of Archipelago, a rock that flew into the sky from the first volcanic eruption was struck by one of the rays emanating from the Orb of Sunshine. Magic from the orb impregnated the rock, forging it into the Dagger of Pa’hoa. The Oracle, known in Archipelago as the Flame of Eternity, quickly becomes the sacred guardian of the dagger, which doesn’t see the light of day for another 422 years. 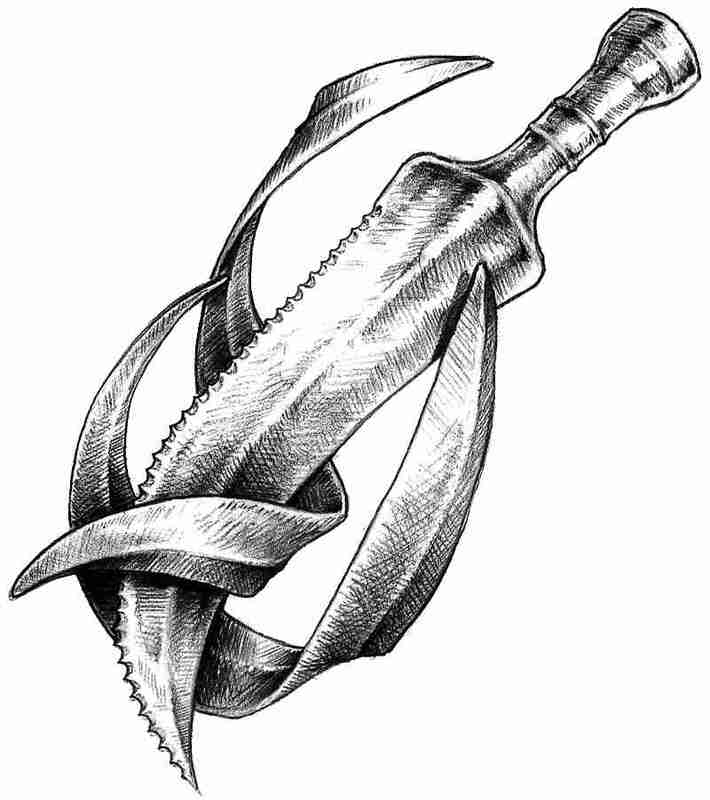 Island lore foretells that the dagger has vast destructive powers. The volcano island of Lua’pele, the first island to have been created by the Orb of Sunshine, erupts to become the largest island I the chain. The first peoples of Archipelago begin populating the small island chain. The volcano island of Lua’pele erupts, spewing lava and ash into the sky for several months. Local settlements are destroyed with people fleeing to neighbouring islands. Following the recent eruption of the volcano on Lua’pele, the island is permanently evacuated. Islanders choose instead to settle on the neighbouring island of Atoweena, which becomes the most populated island in the chain. Palm Crabs are first spotted in Archipelago. Since this time, they are known to invade islands from time to time, killing and maiming at random. The locals believe them to be dark creatures of the underworld that come up through the centre of the earth. An ever-increasing number of village settlements prompts discussions around how the islands are to self-govern. A political structure is agreed in which each island sees the appointment of a Protector to oversee and manage island affairs. The Orb of Sunshine is enshrined at an altar on the island of Kihala. The orb was believed to have magical powers and is revered by islanders from all over Archipelago. After years of living in close proximity to venomous Ki’koohoi spiders, a spate of deaths triggers the inhabitants of Atoweena to finally move all settlements away from the Panu’wahi region in the island’s north. The region is generally considered unsafe and off-limits to all islanders, who avoid the area as much as possible. Following expansion of a number of settlements on Atoweena, the main inhabited island of Archipelago, new settlements are established on the neighbouring island of Kihala. Tu’hutu is born on this date in the village of Piya’ata. A long-lived elder of Archipelago, Tu’hutu becomes a keeper of knowledge and a source of wisdom for islanders. Following the death and ailing health of the original island protectors, new leaders are chosen. The events marks the first of what would become a traditional Protector induction ceremony to be held every 40-60 years. Kahu’niti is born on this date. At the age of 43, the man becomes a reclusive hermit choosing to isolate himself on the barren island of Ulaia. Islanders remain unclear as to his motives and believe him to be suffering from mental illness. Paleki is born on this date. With a penchant for athleticism, he quickly becomes a leading figure in his local village of Hulawei, the main settlement on Atoweena. Alika is born on this date. Born to some of the first inhabitants of Kihala, Alika thrives as an explorative child and grows up to become a trusted figure on the island. Luana is born on this date. Luana develops into an outgoing and curious young woman with a thirst for knowledge and exploration. Luana’s sister, Kalena is born on this date. Kalena and Luana have no further siblings. Luana’s parents are killed in a boating accident. Luana and her sister are entrusted to Tuhu’tu who temporarily relocates herself to Hulawei, where she hoped to receive more support in raising the two children from that larger settlement. The Goat takes an interest in the islands of Archipelago at this time. His sadistic nature is exercised when he coerces Kahu’niti into murdering Kalena. The Goat’s motives for this are unclear. Wracked with guilt almost to the point of madness, Kahu’niti secludes himself away believing that to do so would prevent him from being forced to harm others in the future. In a ritual ceremony that takes place only once every generation, Alika and Paleki are chosen by the local population to become island protectors. After coming of age at 15, Luana spends the next three years exploring all the islands of archipelago. Joshua and his friends arrive in Archipelago. Joshua and Sarah arrived by means of the Orb of Sacrifice provided to them by Protello. Andrew and Galleon are banished there by the Goat.